Over the years, I have treasured my memories of Christmas at my grandparents’ home. Although no specific gift stands out in my mind, the aroma of cherry pie and the sight of homemade noodles drying in front of the stove linger. These family traditions could be counted on, year after year. The warmth and sense of security I experienced during those gatherings are mine to remember and to pass down to my own children. Family traditions are events, large or small, that give family life meaning and texture. They are the substance of memories and include activities surrounding the holidays. Family traditions are also defined as beliefs, ideas, and practices handed down from generation to generation. In order for our traditions to continue to exist, involvement in the past, the present, and the future is necessary. As the parent of a child with autism, you may already be aware that your child likes to do things the way they have always been done. That’s why it’s important to start traditions early. 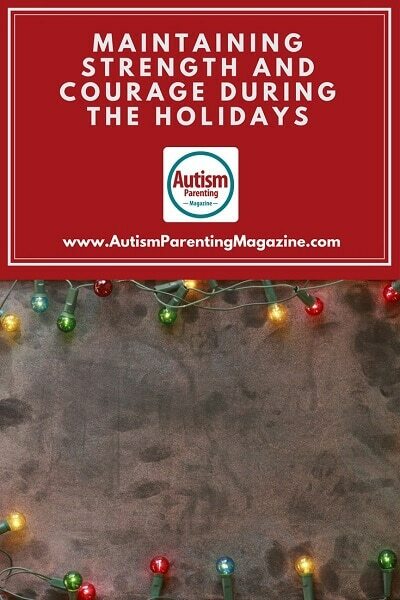 Although you work to help him/her become more flexible in daily life, your child will enjoy the familiarity of specific activities around the holidays. Including extended family in some of your activities will increase his sense of family unity. They foster feelings of closeness and family stability. They protect our sense of security amidst the abrupt changes that sometimes come into our lives. They act as assurances for children and young adults as they deal with the pressures of growing up. Traditions are also important for the emotional health of the family. Healthy families have strong senses of family with an abundance of traditions. A family’s way of making holidays special has a way of making children feel special too. Traditions suggest a sense of continuity. They are threads of our past, weaving into a heritage of memories. Traditions that started in our parents’ families require only a brief recall, but how far back does the tradition go? As traditions are passed from generation to generation, family members sense that what they are experiencing and doing is important. Involve the whole family. Your children will feel a sense of belonging as they participate in the celebration. They can enjoy such activities as cleaning up wrapping paper or passing out gifts, etc. Modify traditions to fit your child’s special needs. You know what works best for your child, and other family members can learn to lovingly accommodate those needs. Get your priorities straight. Don’t try to celebrate someone else’s Christmas. Some of your traditions may need to be modified as you adapt to your “new normal” as the parent of a special needs child. And that’s OK. Don’t allow the criticism of someone, who has never walked in your shoes, to stress you out. To stay strong over the holidays, it is necessary to list your priorities, clarifying what Christmas means to you and your family. Questions you may ask yourself are “Is it more important for me to enjoy my immediate family or to visit relatives?” or “Would I enjoy baking, making gifts, or other activities?” Instead of asking, “What do I want to do?” ask “How do I want to feel?” Do you want to feel calm, relaxed, and able to enjoy the simple pleasures of the season, instead of feeling overwhelmed as you rush about trying to meet unrealistic expectations? As you know, your child with autism will quickly pick up on your level of stress. May God bless you as you enter this holiday season. May you come from a place of strength and peace as you enrich your senses of family unity, stability, and continuity through your own uniquely meaningful family traditions. Stephanie Murphy, LMFT, is a licensed marriage and family therapist and the author of Strong and Courageous: Encouragement for Families Touched by Autism which can be ordered from her author website. In Strong and Courageous, she comes along beside you as you maneuver the twists and turns of parenting a child with autism. She draws not only on her three decades as a family therapist but also on her personal experience as the grandmother of a child with autism. Stephanie has learned to press into God during difficult experiences and understands what it means to become strong and courageous in His strength. She is actively involved with her husband in his life’s work as a missionary to young people in Europe and Costa Rica.